The "Regional Training Course on the Use of Environmental Satellite Data in Meteorological Applications for RAIII and IV," which took place in Córdoba, Argentina between September 22 and October 3, 2008, was sponsored by WMO and NOAA NWS, and organized with the assistance of CONAE, CIRA, UBA, INPE, Eumetsat and The COMET Program. The goal of the training course was to increase the skills of Latin American meteorologists for providing better services through the use of environmental satellites. 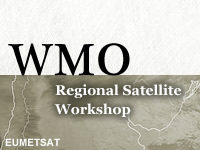 This Webcast collection offers the following seven lectures presented at the workshop, five in Spanish, and two in English: 1) Sistemas que cruzan el ecuador: Intrusiones en el hemisferio Norte y Sur (Mr. Mike Davison, HPC International Desk); 2) Los productos de Meteosat y Metop para las Américas (Mr. José Prieto, EUMETSAT); 3) Procesos de mesoescala y tiempo severo. Influencia de la corriente en chorro en capas bajas en el Sudeste de Sudamérica en la convección profunda (Matilde Nicolini, Grupo de Modelado de Mesoescala CIMA-CONICET/DCAO-Universidad de Buenos Aires); 4) Datos y productos satelitarios disponibles para Sudamérica (Lic. Gloria Cristina Pujol); 5) Forecasts and Warnings of Aviation Hazards:Turbulence and 6) Warnings of Aviation Hazards: Detecting Icing Clouds (Mr. Herbert Puempel, WMO/RMTC); and 7) Ciclogénesis (Mrs. Claudia M. Campetella, Dpto. de Ciencias de la Atmósfera y los Océanos, Universidad de Buenos Aires). Note: Most of the lectures in this collection are delivered in Spanish. Accordingly, the quiz and survey are available only in Spanish. General objective These presentations will allow participants to increase their knowledge and skills in the use of satellite data and products. Specific objectives * Update the learner's knowledge of available data and products (from operational satellites, as well as research and development missions), available data sources and distribution methods. * Increase knowledge and skill related to the use of satellite data and products, particularly in support of aviation services.